(Natural News) People use plastic for a variety of reasons, which has given way to the production of different kinds of the material. However, one of the unintended consequences of such an expansion is that of improper disposal. Experts have developed recycling methods to reduce plastic waste, in an effort to mitigate environmental damage. Now a joint project by U.K. and Brazilian researchers discovered a way to reuse a common plastic to break down harmful synthetic dyes in wastewater, as reported in a Science Daily article. The study, published in ACS Applied Materials and Interfaces, describes how synthetic dyes – used in clothing manufacture – could be treated by polystyrene, a versatile plastic mostly used in packaging and cutlery. The researchers aimed to reuse polystyrene and produce a new material from it by freezing it in a solution with cyclohexane as a solvent. This expands the material into a solid polystyrene foam which can support nanoparticles. The new heterogeneous material can then be used to remove contaminants such as synthetic dyes, which are known to be carcinogenic, and can even be a reproductive toxin to humans and animals alike. One such example of these dyes is Rhodamine B, which is banned in food production but is widely used in wastewater treatment plants to detect leaks. The researchers said they were motivated by the recently released BBC series “Blue Planet II” – which featured the scale of plastic waste in the oceans – to develop a method to break down, recycle and reuse plastics, to help reduce the vast amount of plastic debris by turning them into “a resource for tackling environmental damage” in the form of a new water treatment method. If you’re wondering what happens to the water you just flushed down the toilet, eSchoolToday.com shares a basic layout of sewage treatment. Essentially, wastewater travels down from your drain and into a pipe, which joins a larger sewer pipe, that connects to a major pipe that leads to the treatment center. The water then goes into a screening, wherein large solid objects such as sanitary items or plastic products are removed to prevent blockage or damage to the equipment. Next, the water goes into the primary treatment, where organic solid matter such as human waste is separated from the wastewater. The separated matter, called sludge, sinks to the bottom of large settlement tanks, where they will be subjected to further treatment. Meanwhile, the wastewater moves to the secondary treatment, where it is put into large rectangular tanks called aeration lanes. Air is pumped into the water which allows bacteria to break down the remaining sludge that escaped the separating process in the primary treatment. 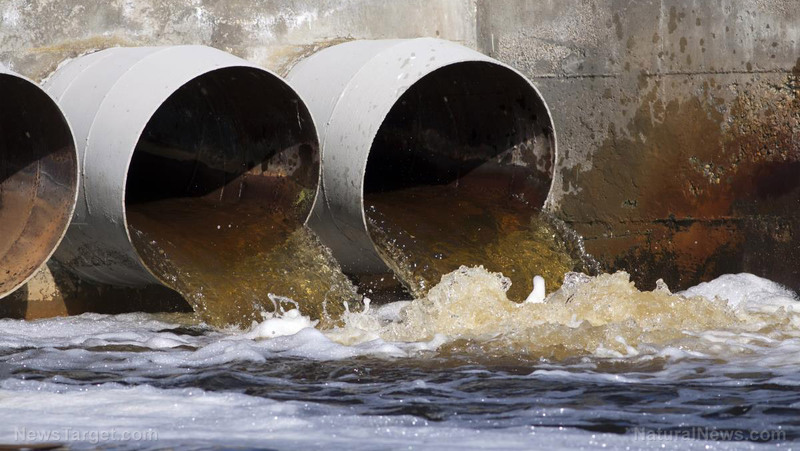 Toxic chemicals are continuously being released into industrial wastewater plants, which cause damage to aquatic ecosystems. Visit CleanWater.news to find out more.